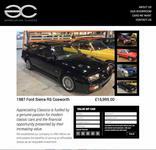 A truly beautiful, and original Ford Sierra RS500 Cosworth is proudly offered here for sale. 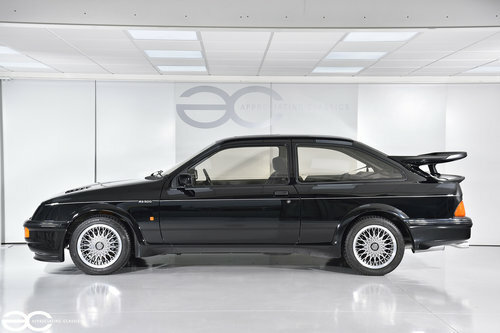 Not only is the RS500 a rare car in itself, but examples like this are very rare – being in totally original paintwork (verified with high quality paint depth gauge). This is what we would refer to as a ‘survivor’ having had no restoration works, but instead being cared for and cherished from day one. Also within the history file is a letter from a previous owner, stating that he kept the car in an air chamber and it was only used in good weather. This is clearly apparent, when looking at things such as the door cards, and parcel shelf, with minimal UV ‘bleaching’ and very little to zero warping/lifting of materials which is a very common problem with these interiors. 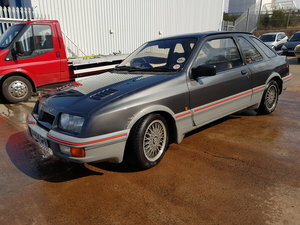 Supplied new by Ford dealer – White Bros Ltd (Taunton), this RS500 has great provenance. Of course, the original booklets are present, including the service booklet which is stamped as per below. Also present are invoices for the servicing, and invoices that date later than the stamps within the booklet – showing that this car has been cared for to a very high standard. The original Ford extra cover agreement is within the history file, along with a vast MOT history to warrant the mileage nicely alongside the service history. 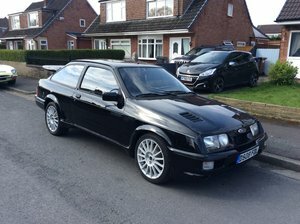 The RS500 build sheet data is present, and the car is number 0331. A letter is also present in the history file, explaining that within his long term ownership, the car was kept within an air chamber, and was only driven/enjoyed in good weather. He also states that whilst he owned the car it was serviced yearly. V5 states 2 previous owners. Within the file are invoices which match the service stamps, plus invoices which date later than the stamped history. 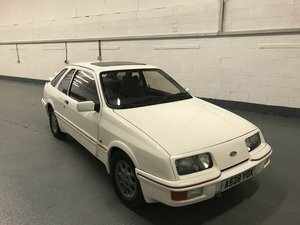 We can confirm that the paintwork on this RS500 is original – we use a high quality paint depth gauge to check this (not a cheap or inconsistent item). The car does have some patina, which you would of course expect, but this is minimal, certainly when considering the mileage. In terms of the patina, this is simple small stonechips, mainly to the underside of the arch spats, and of course on the front bumper, but rest assured they are certainly nothing to worry about. No corrosion is present on the bodywork at all. We have had a simple single stage machine polish, just to really bring out the best in the original paintwork, and it looks simply superb – we have uploaded videos on to our social media and the finish is close to mirror finish. 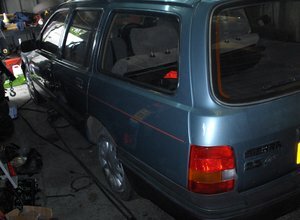 The wheels have been refurbished professionally, and are unmarked – wrapped in matching premium tyres. All glass is original, with the windscreen being in very good condition with only very minor de-lamination in the two lower corners. The scuttle panel is without any breaks, and sits nicely. 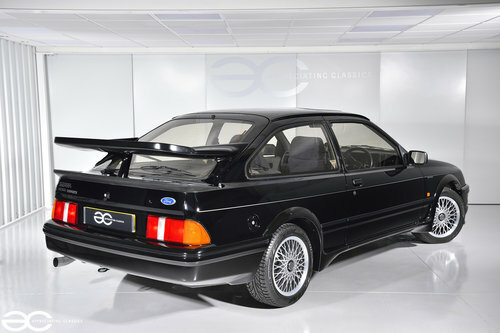 Original RS500 splitter is still in place (has not been replaced with a fibreglass copy) and so are the original RS 500 rear spoilers. As well as this, the fog lights are in the boot also. A very well presented example, ready for its caring new owner. The interior of this example, really is in superb order throughout. The usual ‘troublesome’ areas are all very good, with the headlining showing no signs of any sagging at all. All door cards are without the usually lifting of material, or warping along the top. The parcel is again, very straight and without any holes for additional speakers – the first aid kit is in place also. Of course, everything works just as it should do, including all functions on the original stereo and the MFD. Rear seat belt buckle ties are undamaged, and all four seats are in great condition, with none of the usual wear & tear holes in the drivers seat bolster. 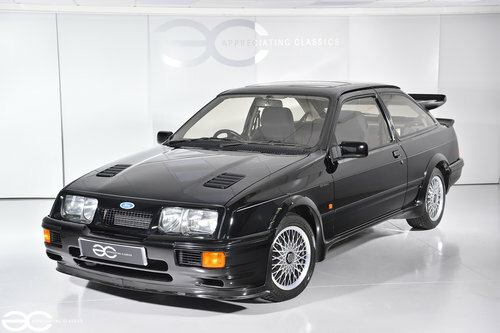 Of course, this RS500 runs as well as it looks. 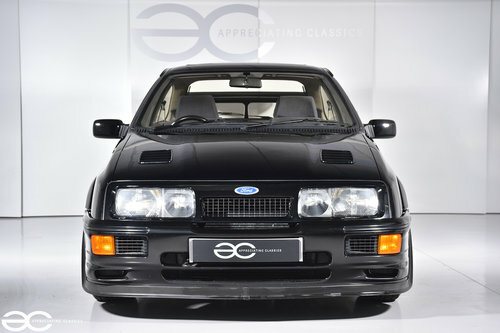 Running totally standard power, which was a claimed 224bhp when released, this RS500 drives just as you would expect. With no smoking either on start up, on boost or on overrun, and running very quietly from cold it is clear from the history that this is one cherished vehicle. With a claimed 0-60mph time of just over 6 seconds, and a top speed of over 150mph the car still feels exciting to drive on the road, with strong performance, as well as a great presence. As with the rest of the car, the engine bay itself is in original condition and has had no refurbishing carried out. All running gear is in great order, as is the underside of the car itself – which is original finish and without any repairs, or corrosion. The car does have Koni shock absorbers fitted, which is a recommended upgrade over the originals if the car is to be driven. The only other change, is the exhaust which is a copy of the original – originals are extremely difficult to source now. On the road, the car drives just as it should do, with good and straight braking performance – the brakes on these cars are still surprisingly strong even today. Handling is great, with no unwanted noises and a great feeling of confidence in the vehicle. The wheels have recently been refurbished and are unmarked, fitted with matching premium tyres.